Kickboxing and boxing are two sports that are much related to one another. Though these two sports use almost the same techniques one can still come across many differences between the two. The key difference is that both hands and feet can be used in kickboxing but in boxing only hands are used. While boxing involves punches and blocks, Kickboxing involves kicks and punches. Another difference that is noticed between Kickboxing and boxing is in the way of evading strikes. In boxing, the punches may be evaded by ducking low or using the feet to move away. But in kickboxing, one cannot duck low as there is a possibility of being kicked on the face. Moreover, moving away from the opponent will only make it hard for blocking the kicks. Circling is an important manoeuvre in boxing to change guard. But it is considered less important in kickboxing as you can strike an opponent without changing guard or moving away. While the left jab has much defensive value in boxing, it has less value with kickboxing. Another difference that can be noticed is that the head is the main target in boxing which is not so in kickboxing. Clinching is another important defensive method in boxing used to stop an opponent from attacking. But this clinching technique has no influence in Kickboxing, as there is a great chance of being thrown away by the opponent. 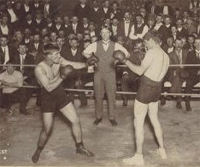 Boxing has its origin in Greece and modern boxing can be traced to the United Kingdom. Kickboxing has its origin in Japan. Japanese boxing promoter Osamu Noguchi created kickboxing in the 1950s. 1. Both hands and feet can be used in kickboxing but in boxing only hands are used. 2. While boxing involves punches and blocks, Kickboxing involves kicks and punches. 3. In boxing, the punches may be evaded by ducking low or using the feet to move away. But in kickboxing, one cannot duck low as there is a possibility of being kicked on the face. 4. No strikes are allowed below the belt in boxing. But a kick boxer can hit anywhere. 5. Clinching, circling and left jab are considered valuable methods in boxing. But these have only very less relevance in kickboxing. 6. Boxing has its origin in Greece and modern boxing originated in United Kingdom. Kickboxing originated in Japan. Prabhat S. "Difference Between Kickboxing and Boxing." DifferenceBetween.net. December 25, 2010 < http://www.differencebetween.net/miscellaneous/difference-between-kickboxing-and-boxing/ >.